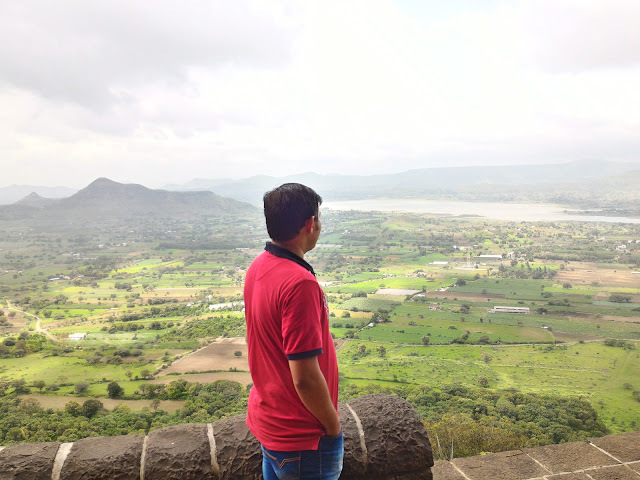 Shivneri fort - Birth place of Shivaji Maharaj - Journey & Life. Shivneri fort, a birth-place of Shivaji Maharaj, is near Junnar town, about 85kms north of Pune (off Narayangaon on Pune Nasik highway). Junnar was known as Jirnanagar and was the oldest city in the ancient India. It was ruled by Shakas Empire and Satvaahan king Gautamiputra Satkarni defeated the Shakas to establish his rule. Satvaahan established this fort. Shahajiraje Bhosle was concerned for the safety of his wife Jijabai during her pregnancy. So, he moved his family to Shivneri fort. Later Chhatrapati Shivaji Maharaj was born in the fort on 19 February 1630. After few years Shivaji Maharaj left the fort and it went into the hands of Mughal in 1637. The base of the fort road starts after taking a left from the statue of Shivaji Maharaj on the Malshej Ghat road. After to you reach the parking area, nice stone steps are laid till the top of the fort. It is one of the easy and steady treks for family. There are seven doors as Maha Darwaja (Main door), Hatti Darwaja, Parvangicha Darwaja, Pir Darwaja, Shipai Darwaja, Phatak Darwaja and Kulambkat Darwaja. We reached on the top after 45 mins of trekking.